Racial disparity is a “significant ongoing concern” requiring further discussion and analysis within the limited role of law enforcement, the report said. 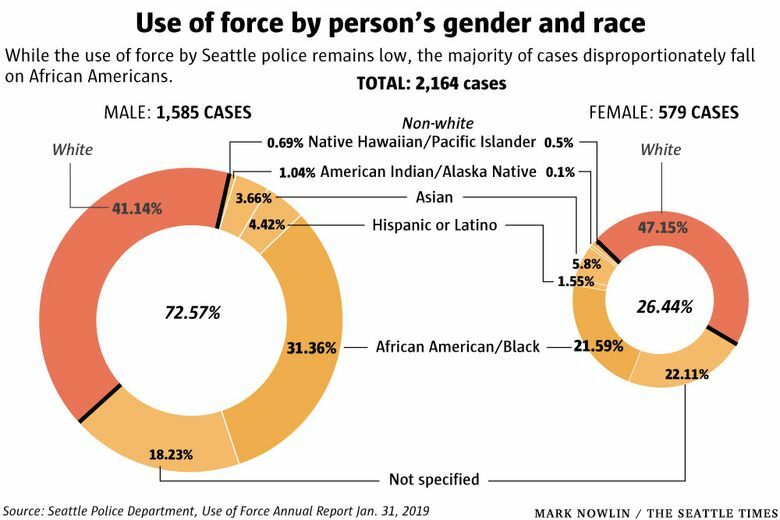 Seattle police are using force at low levels but still can’t fully explain why it is used against African Americans at disproportionately higher rates, according to the department’s annual report submitted to the federal judge overseeing court-ordered reforms. 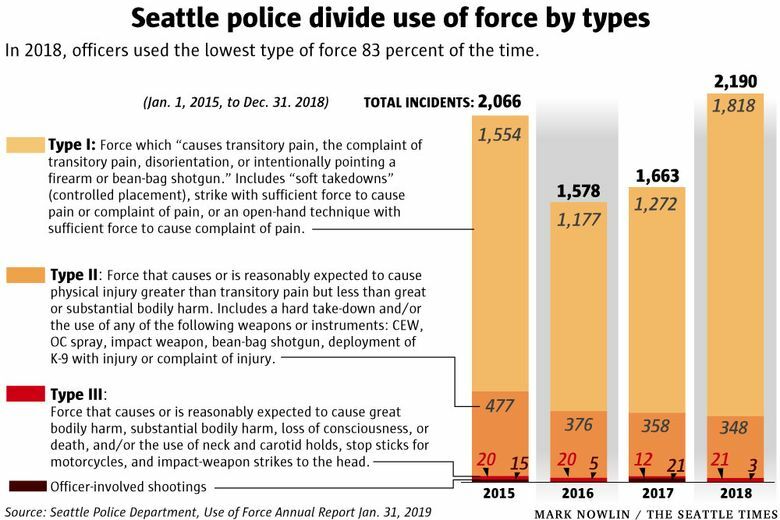 The Seattle Police Department last week filed its 2019 Use of Force report, which shows that the use of force by officers remained “extraordinarily low” last year. Officers reported using force at a rate of less than one quarter of 1 percent out of the nearly 400,000 incidents to which they responded, the report said. That’s in line with the rate reported a year earlier. The report is part of a series to show whether federally-mandated police reforms are being sustained, with an ultimate goal of terminating a court-ordered agreement by 2020. The updates are being provided to U.S. District Judge James Robart, who last year found the city in full compliance with the main terms of a 2012 consent decree with the U.S. Justice Department. His ruling triggered a two-year period in which the city must demonstrate that it is maintaining reforms to address allegations of excessive force and issues of biased policing. 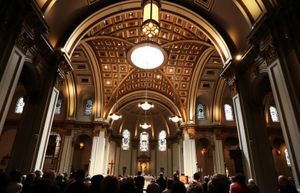 The city took the lead role in carrying out a self-analysis, although the Justice Department and the court’s monitor, Merrick Bobb, scrutinize the progress. The police department’s use-of-force reports follow Bobb’s key finding in April 2017 that the department had made a dramatic turnaround. He concluded that overall use of force was down, and that when officers used it, it was largely handled in a reasonable way consistent with department policies. The monitor found some racial disparity in the use of force, but no statistically significant difference in the type or severity. Officers are more likely to point their gun at minorities but are more likely to go “hands-on” with whites, according to his report. Bobb attributed the overall statistical decrease in the frequency and type of force to the fundamental changes in the use of de-escalation and crisis-intervention techniques, in contrast to the Justice Department’s 2011 finding that officers would escalate even minor offenses, particularly with people in crisis. The new report from the police department shows that 83 percent of the use-of-force incidents involved the lowest type, such as pointing a gun or using “soft takedowns” in which police use controlled placement of people that produces “transitory pain,” according to the department’s definition. Two people were shot and killed by police, including the highly publicized New Year’s Eve fatal shooting of a 36-year-old man in North Seattle. Officers “continue to implement, in practice, the de-escalation training and tactics that have brought Seattle into full and effective compliance with the Consent Decree between the City of Seattle and the United States Department of Justice (DOJ), while maintaining a high level of engaged, proactive law enforcement activity,” the report said. Still, as in the 2018 report, the new figures show a disparity in the use of force against African Americans. Black males represented 32 percent of cases involving males, up from 25 percent a year earlier. Cases involving black females surged to represent 22 percent of incidents where force was used against females, compared with 5 percent in 2017. African Americans make up about 7 percent of Seattle’s population. Yet current sociological and criminal-justice research has not found proven reliable methodology for accounting for all the “multitude of recognized factors” that may combine to result in the disparity, including education, socioeconomic status and family structure, the report said. “In other words, while numbers can identify a disparity, they cannot explain the disparity,” the report said. 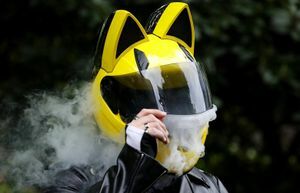 But the department said it would continue to consult academic experts to learn more, including the possible effects of implicit bias. While use of force has not emerged as an issue during the two-year sustainment period, Robart has raised questions about the department’s disciplinary and appeals process that remain under review.